The Packers, should they stay healthy, are in pretty great shape in the skill position area. They now have a stable of capable running backs, including a potential star in Aaron Jones. Davante Adams had a solid breakout season in 2017 and proved to be a talent independent of Rodgers’ greatness, succeeding with Brett Hundley when no other receiver did. Jimmy Graham is a Hall of Fame TE. Randall Cobb is one of the better slot receivers in football and Green Bay now has a reason to target him (they also brought back master of the slot offense Joe Philbin, go watch some 2011 tape. Go. Seriously go watch). All of that sounds great, especially when your quarterback is Aaron Rodgers. What Green Bay doesn’t have, though, is a second outside receiver that everyone trusts. This puts pressure on Davante Adams to both truly be a #1 option and not to get hurt. Green Bay dealt with this in shotgun form last Saturday. The Packers took three huge wide receivers, each with excellent speed. In fact each were exceptional athletes all around. J’Mon Moore, Marquez Valdes-Scantling and Equanimeous St. Brown have Relative Athletic Scores of 8.43, 9.46, and 9.84 (lol). The new Packers targets have all the potential in the word, but face a steep learning curve (or they likely would’ve been higher picks). 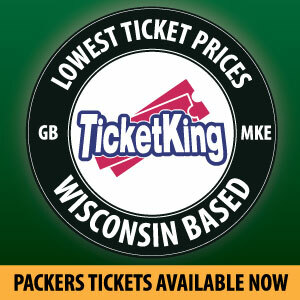 In addition to the three draftees, Green Bay also brings in incumbent competitors. UDFA gems Michael Clark and Geronimo Allison and draft picks Trevor Davis and DeAngelo Yancey will all have a shot at the outside spot as well. Let’s dive into everyone’s game a little bit and then at the end we’ll do some handicapping. Geronimo Allison- Allison is a pretty good football player, but not a good athlete. His RAS of 1.59 doesn’t really fit in with the bigger, stronger, faster mantra of Green Bay’s new management regime. Allison’s combination of a poor 40, 3 cone and vertical paints the picture of a player that doesn’t have the upside of a full time starter. With that said, Allison has made big plays. His athletic limitations seemed to catch up with him in 2017. He was largely unproductive on the stat sheet and Pro Football Focus didn’t seem to care for his film, either. Allison’s grade of 44.0 ranks him 107th out of 116 qualifiers at the position. Davis fits in better with this crew athletically. The third year pro from Cal checks in with a RAS of 8.81. His 40 and vertical were well above average and his 3 cone drill of 6.6 was just silly. Year three is when a lot of receivers “get it” and Davis at 6011 has the height to compete outside. His punt returns drive people nuts but his career average is 12.2 yards per return. That’s really, really good. The average fan just can’t get over a few of the mental mistakes he’s made in the return game. If Davis can “get it”, he has the athletic baseline to be a full time starter. It’s good that Green Bay at least has a third training camp to evaluate him. Yancey is interesting to me because he fills a specific role in Green Bay. The James Jones role. Not a burner, but a guy with excellent YAC, and a real hands catcher. He’s a good athlete, too, sporting a RAS of 8.99. You might not think it because of an average 40 time, but the rest of the numbers check out. Yancey’s a big, strong dude (21 bench reps at 225). Clark is a fan favorite because frankly, fans love tall wide receivers. Clark worked his way up from the practice squad to make it onto the active roster by the end of the season. Green Bay’s receiving corps was ravaged by injury, and Clark was the beneficiary. Four receptions on 14 targets does not paint the picture of a very efficient receiver. Frankly, I don’t see Green Bay trying to work it out with Clark long term. He may spend time on the practice squad but there’s no reason to keep him around just for the inch or inch and a half taller he is than a guy like St. Brown or Valdes-Scantling. Moore is a very good athlete who posted a 40 time that not even he could believe. Moore’s 4.6 was easily bested at his pro day with a 4.49, and reality likely lies somewhere in the middle. The rest of his athletic testing was fantastic. Moore was a left side only receiver at Mizzou and will need to round out his game and learn Green Bay’s entire playbook. Moore also has inconsistent hands. Despite those limitations there’s plenty to work with both on film and athletically. Moore is excellent after the catch and understands the need to high point the football. He also avoids letting the ball get into his body which is something I love in receiver prospects. St. Brown is a fascinating study. Multiple scouts (myself included) had St. Brown as day two prospect. He has elite size and speed but no one know anything about his flexibility or explosiveness score. His tape is interesting as well. ESB was a better player in 2016 than he was in 2017, though that could likely be explained by the loss of DeShone Kizer. 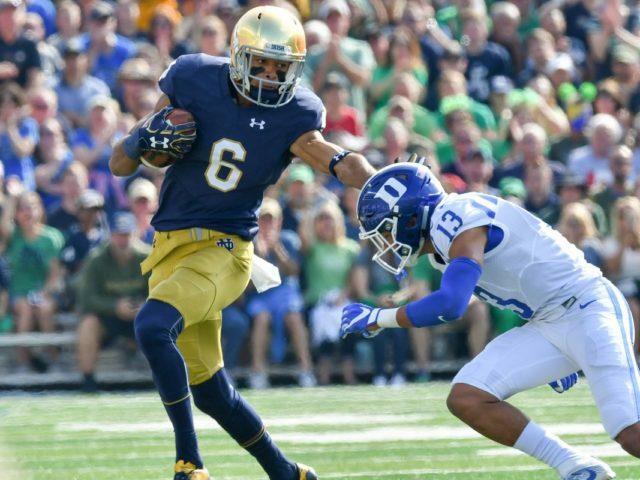 St. Brown played all three positions in the Notre Dame offense and frankly projects as the rookie receiver with the most immediate path to playing time. My best guess is you’re going to have a bit of a Jarret Boykin situation. 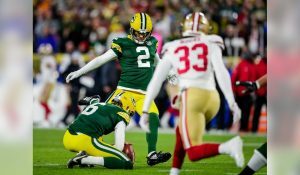 I think it’s likely Green Bay will turn to the opener of a three way competition between Davis, Allison and Yancey (they won’t all make the team). The Packers and Rodgers will likely want to lean on experience (as limited experience as those three have) early. What will likely happen, though, is what happened to Boykin. Adams, the more talented player, took over for him midseason and never looked back. This included him dominating the Dallas Cowboys in the playoffs. Either St. Brown or Moore will take over that starting role some time during the season. It is imperative that Davante Adams stay healthy this season while these young, talented receivers get better. This entry was posted in Authors, NFL Draft, Packers 2018-2019 Season, Ross Uglem and tagged Davante Adams, David Raih, ESB, Green Bay Packers, J'Mon Moore, MVS, NFL Draft, Packers, Ross Uglem. Bookmark the permalink.